A new film soundtrack by Greek composer Vangelis (full name Evangelos Papathanassiou) is something of an event, because his film scores have been increasingly rare in recent years. Following early successes with "Bladerunner" and "Chariots of Fire" which displayed the composer's affinity with synthesiser-based music, we were later treated to "1492: Conquest of Paradise". Since then Vangelis has concentrated on other projects including the album "Mythodea" commissioned to celebrate NASA's 2001 Mars Odyssey Mission. This was a departure for the composer because the album was fully acoustic, performed by a large orchestra and choir. For his epic "Alexander" director Oliver Stone persuaded Vangelis to return to film scoring and we assume to impart some authentic Greek spirit into the movie. The resulting soundtrack gives us both synthesiser and acoustic music blended into an organic whole which suggests the geography of Alexander the Great's conquests. The soundtrack is often grand and epic in scope but is also cabable of being intimate. Many of the tracks on this album flow into each other without a break which creates the feeling of a single symphonic work. Some of the key tracks include "Titans" which introduces a grand theme for Alexander - an ostinato pattern on strings (reminding us of "1492") followed by voices herald this theme which builds into a powerful statement for brass and voices. The theme later makes a re-appearance in "Dream of Babylon". "The Drums of Gaugamela" suggests the military conquest which characterises Alexander's reign, starting with an ominous fanfare which then introduces a continuous drum pattern, ethnic vocal parts sung by the Epirus Polyphonic Ensemble with orchestral counterpoint from the brass and other orchestra sections. A number of the middle tracks are more personal with well-chosen instrumentation giving an exotic feel. "Eastern Path" is very much an atmospheric track which, over a synthesised drone, features the duduk an instrument native to Armenia and the surrounding countries including Turkey, Georgia and Azerbaijan. Roxane's Veil" is a very modern sounding one with synth chords, bass, harp and gentle percussion introducing a wonderfully heady romantic theme on solo violin played by Vanessa Mae. It's the sort of track which could easily find itself on Vanessa Mae's next album or accompanying adverts on TV. Among the closing tracks which round off the soundtrack is "Across the Mountains" which in many ways is a typical Vangelis track with its hymn-like lyricism, ostinato rhythm and characteristic chord patterns. Overall this is an excellent soundtrack by Vangelis, which manages to give us a certain consistency in thought, sounds and instrumentation while simultaneously presenting a great variety of moods and perspectives. The whole is thus very well balanced and satisfying to listen to. 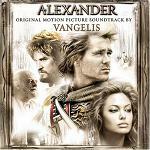 For more information about the movie including the film trailer see the official Alexander the Movie website.